Most collectors rank Outcesticide IV as the first or second favorite of the Outcesticide series (the whole series is great). The disc isn't as revolutionary as the previous Outcesticide discs because quite a few of the tracks were taken from other bootlegs. Blue Moon (as always) did an excellent job compiling this disc, which was the last of the Outcesticide series until Outcesticide V was released in late 1998. This is a "must have" for any Nirvana collector. Outcesticide IV was released in 1996. Additional track information can be found below. Scott Litt Remix - This is a slightly alternate mix that can be found on the rare Pennyroyal Tea CD single and most commonly on the US "Wal-Mart" version of In Utero. Reciprocal Studios Seattle, WA 6/11/88 - This is the version from the Sub Pop 200 compilation. Live on The Jonathan Ross Show 12/6/91 - Possibly the best Territorial Pissings performance ever. See Live, Tonight, Sold Out for part of the video. Gothic Version - Top Of The Pops - Kurt sings the vocals to the bands smash hit "Smells Like Teen Spirit" with a DEEP, SLOOOOOOOOOOOW voice. This has been dubbed the "Gothic" version. The band pretends to play ( puposely doing a poor job miming song) to the recording that is being played in the background. It's funny the first time you hear it, but not worth repeated listening. Live in Rome, Italy 11/19/91 - Taken from the "Seattle Sound, Sounds Great"
Live in Lincoln, NE 5/13/90 - Possibly the most powerful live version of this early "Stay Away" that was ever recorded. Live in Long Beach, CA 2/16/90 - Excellent live soundboard recording lifted from a vinyl bootleg. Live in Lincoln, NE 5/13/90 (same as track 6)- Get the show in it's entirety, IT'S AWESOME! Live at the Reading Festival 8/30/92 - A solid audience recording that is not available on the FM broadcast bootlegs. Alternate studio recording from the 12/24/88 C-tuning session at Reciprocal Studios in Seattle. Live in Nottingham, England 12/03/91 - Early version taken from a vinyl bootleg and contains some "pops" and "crackles." Live in Rennes, France 2/16/94 - Some say that this is the best ever performance of "Sappy." 4-Track Demo 1988 - It's been confirmed that this IS a Kurt Cobain instrumental. ('The Landlord Is A Piece Of Sh** From Hell' 1988) 4-track Recording 1988 - This is a combination of favorite songs, Nirvana demos, sound effects, and various other recordings assembled into a collage by Kurt on his 4-track. A 35-minute version recently surfaced. Hopefully it will be released on a future Outcesticide. This shorter version is not a section of that long version and is a different mix. Kurt went back to the 4-track mastertape and made a different mix, pausing the tape recorder as he went along to make a shorter version that contains all of his favorite highlights. Kurt also stopped along the way to insert a Nirvana song called "The Landlord Is A Piece Of S**t From Hell" that cannot be found at all in the long version. Kurt probably made this version explicitly to fit it on demotapes that he was sending to various record labels, because that is what he did with it. 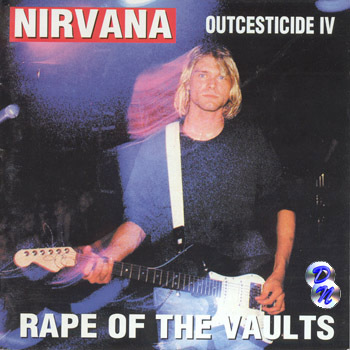 4-track Recording 1988 - Listed incorrectly as "Montage Of Heck Part 2", which is a made-up and misleading title for what is essentially just Kurt fooling around with backwards guitar and voice on his 4-Track. Kurt added it to various demotapes as an in-between song attraction. The "Into The Black" box features ashorter version of this track that was taken from a different demotape as this one. It is listed there as "Buzz Cut" which is also a made-up and misleading title, because the intro to the Love Buzz 7-inch is usually referred to as "Buzz Cut". This track probably doesn't have a title but the lyrics point towards the most reasonably accurate title..."Escalator To Hell". This is the longest available version. Take note that "Escalator To Hell" usually does not appear CD-R or careless clone versions of Outcesticide IV because it appears beyond the 74 minute mark. These discs usually cut off somewhere in the middle of "Montage Of Heck". The other 4 Outcesticides pose no problem because they all clock in under the 74 minute mark. **Special thanks to JWB for major contributions to this review. His insight is appreciated. - the back inlay : the text is in white and yellow, it is easy to spot the counterfeited repressings due to the very blurred letters.